Sometimes meals are so calorie laden I don’t even bother getting out the dinner plates. Instead I grab the salad ones and try not to fill mine up. This meal was one of those times. My friend Carla posted a picture of shrimp and grits she’d had at a restaurant in Kentucky and my craving was instant. But living in the northwest you can’t order this meal. The restaurant staff will look at you funny and probably laugh at you behind your back. So I made it at home. Which is dangerous, because there’s more of it around. But I was good, and didn’t go back for seconds. Although I admit I wanted to! So bad for you but so very tasty. It was worth the splurge. 1. Bring water to a boil. Add some salt and pepper. Add grits and lower the heat to medium. Cook until the water is absorbed. About 15-25 minutes. Remove from heat and stir in butter and cheese. Season with more salt & pepper if needed. 2. Rinse shrimp and pat dry. Fry the bacon in a large skillet until browned. Turn off heat and with a slotted spoon move bacon pieces to a paper towel lined plate. Pat dry. 3. Turn heat bacon on. Add the shrimp and cook until shrimp is about half pink. Add the rest of the ingredients including the bacon and cook until the shrimp is done. 4. Spoon grits onto plates and with the slotted spoon, spoon shrimp mixture over grits. Serve with hot sauce if desired. Recipe by Martha Nesbit from foodnetwork.com. Picture by Laura Flowers. fab meal, exactly what I am craving. A thing of beauty! Kudos for your willpower, I know how hard it is to pass up seconds of good eats like this! We actually only own salad plates since all of us are trying to stay on the low- portion side of things. It's such a great tactic! This shrimp and grits looks delicious...not sure I'd be able to stop at one plate! You had me at shrimp and bacon! This looks ever so good - thanks for sharing! so... why do you say it is so bad for you??? A little butter a little cheese never hurt anyone! Laura, I'm vegetarian and I'm drooling over this! Fabulous as usual. I'd love to try this for my meat eating guests. You know, I've never actually had grits. I must say, this looks like an excellent way to try them! This is one of my family's favorite meals. My recipe doesn't call for bacon, but it would be a nice addition! 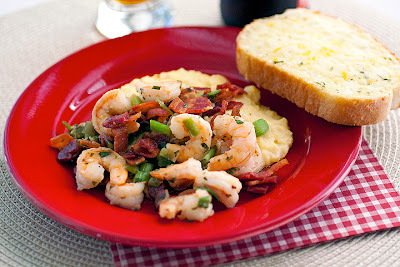 Shrimp and grits are pure comfort food to me...add in bacon, and I'm swimming in culinary pleasure! Thank you for sharing another beautiful recipe with me. You are an inspiration and a blessing. I hope you have a wonderful end to your week, my sweet friend!